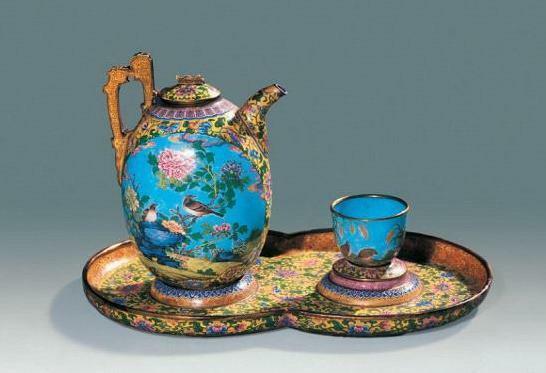 Cloisonne is a traditional form of enamel ware that flourished in China in the mid 15th century. The 13th century Chinese called it "Da Shi" which, when translated means Qiasi Falang 掐絲琺瑯; although no examples of the art existed until the 14th century. 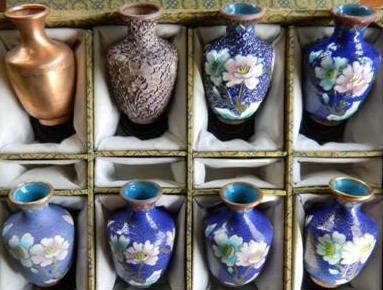 Cloisonne making involves elaborate and time consuming processes. 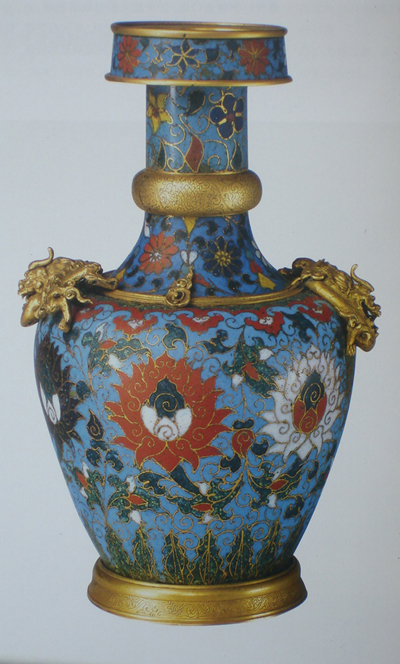 Foreign influence contributed to the development of cloisonne from the fourteenth to the fifteenth century. The art of cloisonne is considered a Chinese art and this assumption is most certainly correct. However, the technique can be traced back to the Mycenaean era from ca.1600 to 1100 B.C as some samples of the art were found at that period. This art cannot be confused with the Canton enamelware that was painted freely and didn't involve partitioned cells. The Japanese cloisonné didn't come into the picture until around the nineteenth century when Khlebnikov and Karl Faberge were creating their own enamel masterpieces in Russia. However, cloisonné had been made in Russia way before the seventeenth century by Lubavin with other Chinese court silversmiths, and it is probably attributable to the Sasanian roots from the Balkans. Cloisonne (pronounced cloy-zon-ay, French for ”partition”) is an ancient metalwork technique that makes use of small, precious metal filaments and colorful glass enamels to create brilliant artwork. The word, cloisonné is a French word which can be translated to mean partitions. The technique involves making designs on metal vessels using colored glass paste kept within the enclosure built from bronze wires or copper which have been hammered or bent into a desired pattern. The enclosures are either soldered or pasted onto the metal vessel. The enamel or glass paste is tinted with metallic oxide and painted in contained areas. The vessel is fired at a low temperature, probably 800 degrees centigrade. The enamel shrinks after firing, and the process has to be repeated severally to fill in all the designs. When the process has been completed, the vessel's surface is rubbed until edges of the cloisonne become visible. The pieces are gilded, mostly on the sides and the interior and lastly on the base. The metal wires are bent into shapes to create small cells, (partitions) of designs, and many coats of finely ground glass enamel are fired into them until one unique piece of art is rendered. There have been four different types of enamelwares. They are distinguished by the process used to produce them - The four processes are: cloisonne, painted enamel, champleve and translucent enamel. 1. Cloisonne is made by gluing copper or brass wires onto a copper or brass body that has been shaped around a frame. Bodies are made in the shapes of vases, trinket boxes, incense burners, and so on.. These wires form small compartments called cloisonne - French for "cells". The cloisonne are then filled with colored enamel powders. The copper or brass wares are then fired several times and polished until the surface is smooth, then gilded with gold. 2. Painted enamel is made by painting enamel paste directly on copper or brass bodies, much like painting white clay to color porcelain. Then the painted item is fired and gilded with gold. 3. Champleve is very much like cloisonne except that the cells are not made by wires. The inside of the body of the item is either carved, pressed or stamped to form recesses. The recesses are filled with colored enamel powder. Then they go through the same firing, polishing and gilding process as cloisonne. 4. Translucent enamel is mostly made in southern China, particularly in the Canton province. It's also referred as "Canton enamel". The biggest difference is the enamels used in this type of artwork. They are translucent instead of opaque. This branch of Chinese cloisonne shares similar characteristics with modern Japanese cloisonne - which almost always uses translucent enamels to give it the look and feel of glass, fine porcelain or polished lacquer. Early Chinese cloisonne objects were made primarily for the designing of palaces and temples because of their ostentatious splendor and can be unusually large, and it was considered as appropriate for the structures but weren't well-suited for a restrained atmosphere like a scholar's home. This idea was expressed by Cao Mingzhong in his 1388 Guide to the Study of Antiquities where cloisonne was dismissed as being unsuitable for a man's chambers. However, during the Ming dynasty, Xuande Period, this ware was prized greatly at court and was used by the wealthy people, nobles and Chinese Officials at the time. Yuan's enamel ware design was influenced by Arabic art and culture. 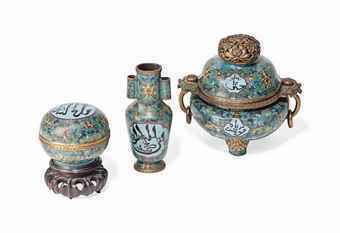 You can detect Islam themed patterns in some Yuan cloisonne. 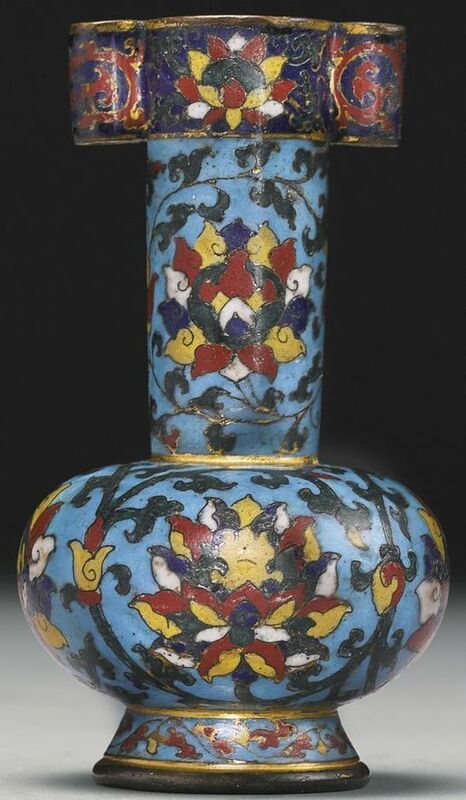 But unfortunately, cloisonne wares are fragile artifacts and very few from this period survive to this day. Another reason adding to its scarcity now is because despite its beauty, Yuan cloisonne was not well accepted by the Chinese at that time due to its origin. Yuan Chinese guarded themselves as the center of the world. Persia was considered the "devil country". Persia is current Iran. Anything made by the devil country was not popular and was only suited to satisfy the fancies of women. The most beautiful of Chinese Cloisonne is probably from the was from Ming Dynasty, Xuande era (1399 - 1435), and the earliest dated Chinese cloisonne was also recorded in the Yuan dynasty (1271–1368 ). Please also read our article for JingTai blue: The Chinese Imperial Blue Cloisonne. 1) Constantinople's fall in 1453 when expert refugee artisans went to China; a lot of the artisans were Sassanians. Sassanians and enamelware were also known in China before this event; Constantinople's fall was simply the final facilitator to consolidate the technique as a Chinese art practice. 2) Trade: What is interesting about the Ming Dynasty with regard to the history of the Chinese silver making art is that even though it was in this Dynasty that the Chinese obsession with accumulating substantial reserves of silver from everywhere in the world was at its highest. Also, it is seen by a lot of people as the motivation that built the notion of the global trade. (Reader may be interested to read our article on: Flow of Silver to China) Though the technique came into China through Changan which was the capital of Silk Route at the time the Sasanian merchants traded along the region, Beijing became the historical, spiritual abode of Chinese cloisonne ware. Therefore it is well documented that the Sasanians were professionals and were responsible for the development of cloisonne art from the basic form to the highly sophisticated level. The wares were then exported to Spain, India, China and the Balkans. This assumption is supported by the fact that the Sasanians were credited with introducing the silver smiting art to China which surfaced in China during the Tang and Sung dynasties. 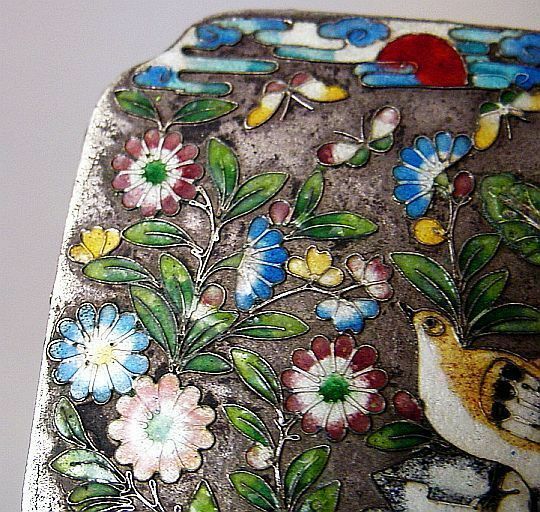 While cloisonne wares continued to boom, they met in the late 18th and early 19th centuries with conventional silver making and the start of Chinese Export Silver. It's the China Trade (Canton System) that acts as a catalyst in this case; ships carrying Chinese tea and an assortment of luxury consignments create an awareness and ultimately an obsession for all things oriental. 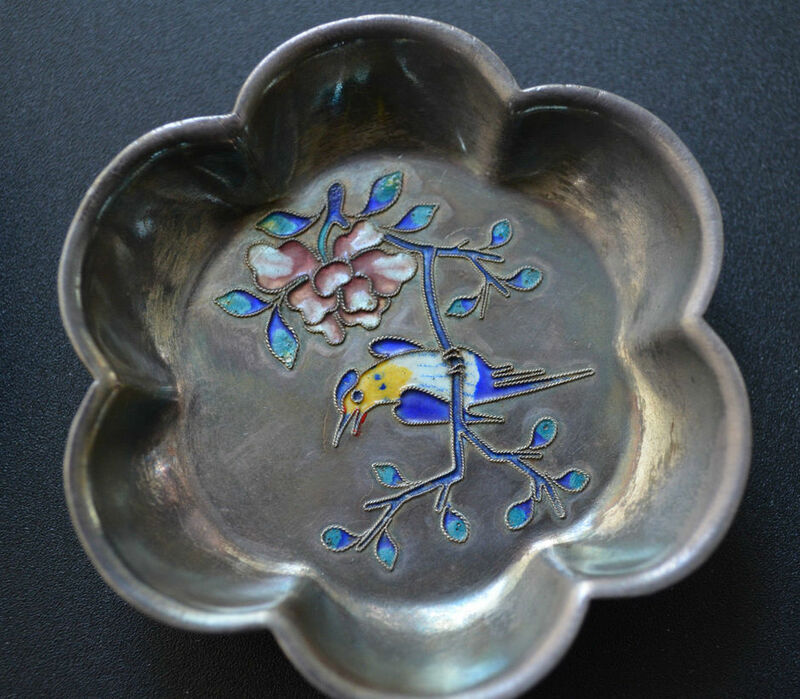 By mid-19th century a lot of cloisonne silver items were being created in Beijing, and silversmiths in other centers for silver making did make silver items in partnership with cloisonne. The end-19th century was when Chinese silversmiths started to incorporate their cloisonne work with pieces such as tea and coffee sets, and tea pots, coinciding with the crusade in Chinese Export Silver which planned to adopt a higher Chinese panache in contrast with the neo-classical replicas of Western silver which had been in high demand for roughly 60 years or more. It's this tea ware that became somewhat of a spectacle, especially among the Chinese collectors. The other way to distinguish Yuan cloisonne is the markings. Usually Ming or Qing wares were marked with Chinese characters to indicate the reign in which the artwork was made. Yuan cloisonne usually don't usually bear any marks or the sometimes use a design (without any characters) as the mark. Early Ming wares are sometimes not marked either. Hence it is quite hard to differentiate between late Yuan and early Ming cloisonne. This is usually not a big problem since the Yuan dynasty only lasted for mere 97 years.